Long Live Tennis in the Desert? Was that all just crazy talk, or did Indian Wells almost pack it all up and head to Shanghai? What, you didn't hear about that? Indian Wells moving to China? Hard to believe, but it could have happened. And maybe it almost did. Was this almost the new home of the tournament we know as Indian Wells? That would have been shocking and really, really depressing. But before most people in tennis even heard about it, the crisis was (probably) solved. And it looks like the difference was the involvement of the USTA. I think it was Joni Mitchell who first wrote "you don't know what you got til it's gone. "And it would have been that way for Indian Wells. In my opinion, not enough people know what it's like there and how good the event really is. 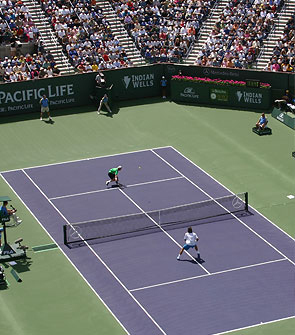 Indian Wells likes to think of itself as the Grand Slam of the West. That may be a public relations buzz phrase but it's not that far off the truth either. I've said it before but the environment there is perfect to absorb the intensity, athleticism and stunning technical skills of the best players. And a big part of that for me is the (mostly) dreamy, warm March desert weather. OK you can get some nasty wind or even a desert sand storm. But getting out of town, getting warm, (hey it's cold all year in San Francisco) and watching dozens of world class players at point blank range--that's a trip every tennis player should consider making in March. If you get close to the players on those outer courts, you learn something by osmosis whether you realize it or not. More on that later, and how you might participate in a special Tennisplayer outing we are considering for Indian Wells next year. How could a great tournament with the top men and women be losing money? But back to the Shanghai scare for a minute. So far as I can determine not much has been written about the whole deal. In fact almost everything we know comes from a few stories done by a sports writer named Leighton Ginn from the The Desert Sun in Palm Springs. Here's what I pieced together after reading his articles, taking to Leighton on the phone, and doing a little research of my own. Not sure it's 1000% accurate but it is what is publicly out there as of now. Indian Wells may have one of the best overall tournament environments in the world, but, amazingly, the tournament has been losing money for the last several years. How could that be? It all goes back to the marketing deal the ATP made that was intended to catapult tennis to a whole new level of worldwide media prominence and multiply the money for everyone involved. Remember the name ISL? Probably not. Very few people in tennis had ever heard of them. ISL was a Swiss marketing company founded by Horst Dassler, whose family owned Adidas. They were a huge player in World Cup soccer, controlling marketing and TV rights. They paid $1.2 billion to the ATP in 2001 for the unified marketing rights to the tour. It seemed shocking at the time. I remember asking a lot of knowledgeable tennis people about ISL, and drawing blanks--and this was from a group of writers that loved to pontificate at length about any subject related to tennis. Was the cost of the big stadium insurmountable? What was more shocking was that one year later--again seemingly overnight--ISL went bankrupt. So just as quickly as it appeared, the whole ATP deal was gone. The full details of what really happened have never been explained, so far as I could find, and they probably never will be. There were allegations in the press of kick backs and mismanagement in the ISL soccer dealings. If you search around on the web it's very hard to find any detailed or conclusive information to know the truth one way or the other. But there was a big ripple from the loss of all that money in tennis, including a big ripple in Indian Wells. The tournament was counting on its share to cover costs associated with its new stadium. Without that $10 or $12 million a year, suddenly the numbers for the tournament were red not black. Because so many of the costs were fixed, this was a difficult problem. 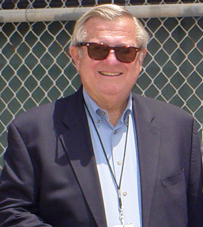 Indian Wells is half is owned by Charlie Pasarell and Ray Moore, the two former players who started the tournament. The other half belongs to sports management titan IMG. But when IMG founder Mark McCormick died, IMG was sold, and the story was that the new owners wanted out. 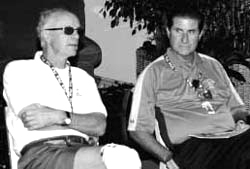 Ray Moore and Charlie Pasarell: the visionaries behind the Grand Slam in the desert. That's where the Chinese came in. It has been reported that they offered at least $35 million for the event, maybe up to twice that. Shanghai has a great new stadium, if you saw any of the Masters Cup at the end of the year. It was also reported that IMG was pushing hard to sell. A new group called the Tennis Company appeared with the goal of helping Pasarell and Moore buy out IMG. The Tennis Company principals are Robert Miller, who owns Tennis magazine and George Macklin who owns a travel and tourism company called Custom Marketing Group. But there was a condition. The Tennis Company wanted the USTA involved, including financially, and at a substantial level. USTA President Franklin Johnson: doing what it takes to keep Indian Wells where it is. Under the leadership of new President Franklin Johnson, the USTA board voted to participate. Supposedly the magic number to get IMG out of the deal was $24 million. The USTA financial involvement has been reported at $6 million, although that could supposedly go up over time. But no one has talked about the exact numbers, the financial structure and/or the business relationships between all the parties. I hear they may announce more at the event--or maybe not. Here's what USTA President Johnson has said publicly so far: "The Pacific Life is one of the world's most prestigious tournaments. Our intent is to do enough with the other investors to buy out IMG. We will proceed on an agreement that will achieve that." So is the danger past? So it appears. Ray Moore was quoted as saying: "We won't have to worry about the future of the tournament for 20 years." All that sounds pretty good for people who love Indian Wells. You could speculate that the travel and tourism component involving the Tennis Company could be a big future dimension, especially when combined with the USTA expertise and marketing leverage. The prettiest--and most accessible--practice courts on the tour? Sports fans in LA, unless they are true tennis fanatics, just don't make the two-hour plus drive out there for a day of tennis matches. In fact you have a hard time getting LA fans to drive 30 miles south to Carson to see the women's pro event. 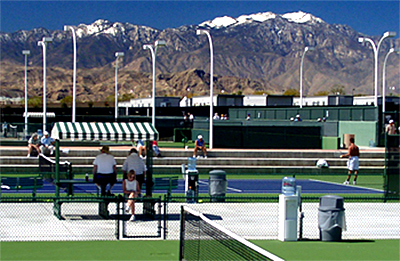 But as a travel destination Indian Wells is a whole different deal. Personally that's why I've always loved this event. You really feel like you are on vacation. I've always had a thing for the desert anyway--all that open space, fresh air, sand, big rocks, strange plants, and the green of all those manicured golf courses. Plus tennis courts everywhere, including a few places that have red clay and grass. Great restaurants, assuming you like animal protein. 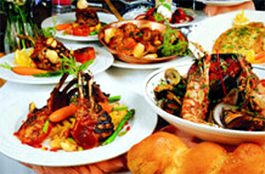 The hotels and restaurants are great--unless you are a vegetarian. The players are collected at one or two hotels, so you can see them around getting coffee in the morning, hanging around the lobby, and sometimes in the bars. Last year we had breakfast with Roger a couple of times, he just didn't know it. You go out to hit some balls and find main draw players practicing on the hotel courts, or working with their coaches. It's fascinating to watch. You get on the shuttle bus and a smiling driver takes you right to the event. It takes 5 minutes from the tournament hotels. You can have a tennis experience close to the Grand Slams, and in some ways better because it's easier to get close to the players. And you can have a world class resort experience at the same time. I really do love the whole New York City urban thing and I love the Open. But if more people who loved the tennis in other parts of the country knew more about Indian Wells, I believe they would come every year in greater numbers. The success of the Open makes it tougher to get close to the players. Which brings me to my next point, which is actually a question. How many of our readers out there would be interested in something like that? A package that included access to the tournament, a cool desert hotel, and maybe a Tennisplayer.net clinic? I'm thinking something like 3 or 4 of the early days at the tournament--maybe the first Saturday, Sunday, Monday, and/or Tuesday. You get a day pass which allows you to roam the outer courts at will. Virtually every player in both the men's and women's will play at least one match over that period. You buy stadium tickets depending on the schedule and who is playing in the main venue when. 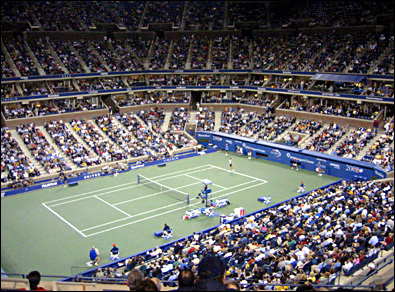 It's relatively easy to get great seats on the outside courts--a lot easier than at the Open. And the practice courts are a tennis voyeurs dream--wide open and tiered so you can actually look over at them from the top of the back fence. How about a clinic with Scott and A.J.? We could do a clinic with one or two of our fabulous contributors like Scott Murphy and A.J. Chabria. Maybe we even work up a talk from Robert Lansdorp. And J. Gregory Swendsen, our digital photographer, would probably share his deep personal knowledge of desert steak houses and other insider restaurants. It wouldn't be without cost, but I've already talked to the tournament, and Tennisplayer could put together a package deal. It's just an idea. So let me know if you think it's a good one, and we can start to put it together for 2007. Email me at: jyandell@tennisplayer.net. Let's get in on it before the new partnership gets too successful and the tournament gets as crowded as the Open.